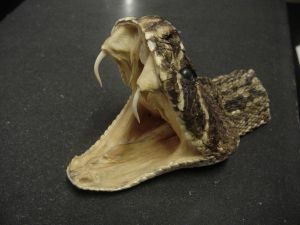 Eastern Diamondback Rattlesnake for Kids: Learn about this dangerous venomous snake. The Eastern Diamondback Rattlesnake is one the largest venomous snakes in the world. At 8 feet long, it is certainly the largest in the Americas. Rattlesnakes are part of the snake family called pit vipers. This is because they have small temperature-sensing pits on each side of their head that help them find prey in the darkness. The Eastern Diamondback Rattler can be found in the southeastern portion of the United States. They live in all sorts of habitats from forests to marshes. They like to live in burrows made by mammals such as gophers. Eastern Diamondback Rattlesnakes have a thick body and wide triangular shaped head. They have a dark diamond shaped pattern running down their backs which is outlined in a lighter yellow color. Their tails end with the dark rattle which they will often shake to warn off other aggressors. Diamondback rattlers like to eat small mammals like rats, squirrels, and birds. They will strike their prey and then wait until it dies from the venom before eating it. Since the Eastern Diamondback is a reptile, it is cold-blooded. This means that it needs to regulate its body temperature with the environment. To do this the rattlesnake may be found sunning itself on a rock to warm up or hiding deep in a rotten tree stump to cool off. A group of rattlesnakes is called a rhumba. The baby rattlers are about a foot long and are born in groups of 7 to 15. They are poisonous at birth, but their rattles don't yet rattle. These snakes are very dangerous, aggressive, and venomous. They can strike quickly and for up to two thirds of their body length. An adult rattle snake can control how much venom it releases and the effectiveness of the strike can vary. A baby rattler has even more potent venom and may continue to strike releasing more venom due to a lack of control. Either way, any person bit by an Eastern Diamondback Rattler should seek medical attention immediately. It was the symbol of one of the first flags of the United States called the Gadsden Flag. The flag had the rattlesnake on it with the famous quote "Don't tread on me". Oftentimes rattlers return to their mother's den each winter. The same den may be used by future generations for many years. They don't always rattle before they strike.